You know that 17-year old who was arrested and accused of plotting a massacre that would rival Columbine. He stockpiled bomb-making materials and planned to blow up the local high school on the first day of school. Well, he may have had advanced warning that he was under FBI surveillance and casually shrugged it off. 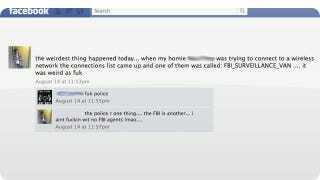 A post on his Facebook page suggests he and a friend detected an entry for "FBI_SURVEILLANCE_VAN" while scanning for local wireless networks.